In the Star Wars space opera, most of us would be able to tell right from the get go just who are the bad guys, and which are the good guys who are all out to save the galaxy from the firm grip of a crazed Emperor Palpatine. Well, those who need to eke out a living have signed up with various Stormtrooper divisions, simply because the Rebel Alliance are unable to pay that well, not to mention they do not have the latest hardware to play around with. Still, this does not mean all under the Galactic Empire are evil, some of them have a heart so much so that they keep pet birds in their homes. 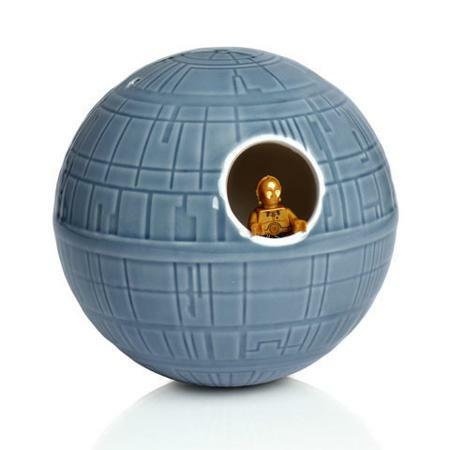 If you are part of such a crowd, why not do so with the £24.99 Star Wars Death Star Birdhouse to stay in vogue? Of course, the Rebel Alliance might not look on to this particular birdhouse design too kindly, especially when it has been used to blow up an entire planet in the past, so any representation of this particular symbol should not be used despite the fact that it houses a life (or more!) within. At the very least, this is the deadliest birdhouse in the galaxy, no? Made out of high quality ceramic, there are no exposed thermal exhaust ports that could compromise its structural integrity. Watch out for dropping “torpedoes” from above now!